Step up to truly realistic pictures and sound See how more exciting movies and shows can be when you combine the power of our 4K HDR Processor X1™ with Acoustic Multi-Audio™. Pictures and sound in perfect harmony Be in the moment with true-to-life pictures and acoustics to match. Beautifully detailed images combine with our Sound-from-Picture Reality™ for a captivating audio-visual performance. One chip, incredibly real With Object-based HDR remaster, our 4K HDR Processor X1™ reproduces enhanced depth, textures and natural colours. You’ll see pure colours at higher brightness levels for exceptionally realistic pictures. Sound-from-Picture Reality™ Our Acoustic Multi-Audio™ system adds two sound positioning tweeters in the rear of the TV to the bass reflex speakers for Sound-from-Picture Reality™. With action and sound precisely aligned, your viewing becomes so much more immersive. Embrace the thrills of the cinema Enjoy cinematic thrills at home. Dolby Vision™ brings scenes vividly to life for authentic viewing, while Dolby Atmos™ fills the room with immersive surround sound. Rediscover every detail in 4K With 4K X-Reality™ PRO, images are upscaled closer to true 4K quality for remarkable clarity. The picture is sharpened and refined in real time, revealing extra detail in the books and architecture of the library. Life's brilliance, revealed with extra colours See vivid real world colours all around you. A TRILUMINOS™ Display maps colours from a wider palette, faithfully reproducing every shade and hue in the umbrellas. Beautiful from any angle This 4K HDR TV has a clean, minimalist design that keeps you focused on what's important - the picture. Cables concealed, neat and tidy Keep cables neatly hidden in the stand and held in place with the supplied cable holder. Make smart even smarter You can ask your Google Assistant to find your favourites. It’s truly effortless and offers the ultimate viewing experience. Control Sony's Android TV™ and other connected devices using your voice - there’s no smarter way to run your life. Easy control with smart remote Connect set top boxes and other devices via HDMI to your TV and control them all using one smart commander. A slimmer, more rounded design with built-in voice control microphone and enhanced button layout makes it really easy to use too. Works with Alexa Connect your Alexa enabled devices for seamless hands-free control of a Sony TV. With Alexa, you can power up your TV, change channels, control volume and more. Say what you want to see with voice search Spend less time browsing, and more time watching. Voice search on Android TV™ provides you with the power of Google search, allowing you to find content across different services without the hassle of time-consuming text entry. You can also get recommendations; asking for “romantic comedies” for example, brings up a list of suitable options. Object-based HDR remaster With Object-based HDR remaster, the colour in individual objects on screen is analysed and the contrast adjusted, unlike most TVs where contrast is only adjusted along one black-to-white contrast curve. 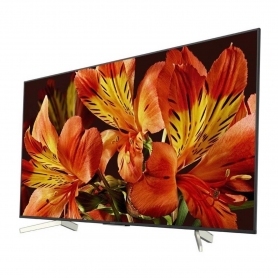 Because objects are remastered individually, this TV can reproduce greater depth, textures and more realistic pictures. Dual database processing One database is used to clean the picture, reducing on-screen noise. The other is used to upscale the resolution, improving clarity. These two powerful image improvement databases work together, dynamically improving pixels in real time. Each database has tens of thousands of references, amassed from our experience creating content for TV and movies over the years. Motionflow™ XR keeps the action smooth Enjoy smooth and sharp details even in fast-moving sequences with Motionflow™ XR. This innovative technology creates and inserts extra frames between the original ones. It compares key visual factors on successive frames, then calculates the split second of missing action in the sequences. Some models also include black-frame insertion for a blur-free and truly cinematic look. Chromecast built-in: Plays nice with your other devices BRAVIA™ is Chromecast built-in so you can easily cast your favourite entertainment like YouTube™ or Netflix from your personal device on to the stunning BRAVIA™ screen. You can cast from Android™, iOS™, or your laptop. Google Play™: A world of content and apps Discover movies and TV shows, games and much more from Google Play™. Enjoy a huge and ever-growing choice of apps on your TV in a brand new way. YouView: the best of catch-up and on-demand TV With YouView built-in, you can scroll back up to seven days to watch shows from BBC iPlayer, ITV Hub, All 4 and Demand 5. You can also access an extensive library of on-demand content. Simply connect your BRAVIA™ to an aerial and broadband connection to get started with YouView. Turn your TV into a digital recorder: USB HDD REC Store your favourite TV shows on an external USB hard disk drive to enjoy whenever you want. USB HDD REC allows one-touch and timer recording of a digital broadcast onto any USB HDD device up to 2TB in capacity. While viewing the show, simply press REC to start recording, which will automatically stop at the end of the programme.